Pakistan's bloody week: Who is really to blame? 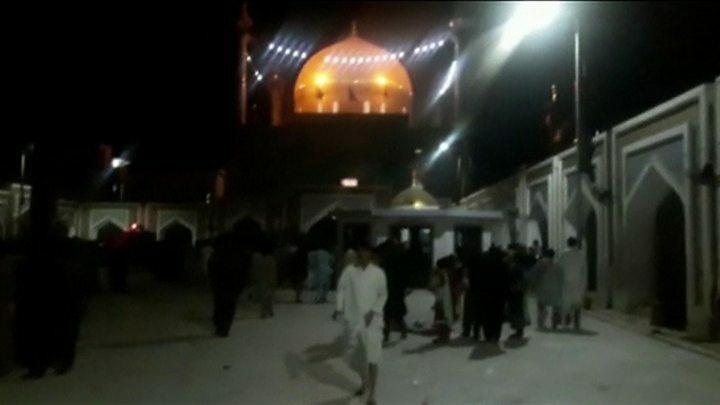 As Pakistan picks up the pieces from Thursday evening's devastating bomb attack at the 800-year-old shrine of Lal Shahbaz Qalandar, the country's managers are looking for scapegoats abroad. And the military has openly taken charge of the proceedings, relegating pretentions of political propriety to the background. Soon after the bombing, army chief General Qamar Javed Bajwa vowed that "each drop of [the] nation's blood shall be avenged, and avenged immediately". There would be "no more restraint for anyone", he said. The object of his remark was clear an hour later when the military announced that Pakistan had closed its border with Afghanistan to all traffic, including pedestrians. On Friday morning, Afghan embassy officials were summoned to the army's headquarters in Rawalpindi. They were handed a list of 76 "terrorists" said to be hiding in their country, with the demand that they be arrested and handed over to Pakistan, the military says. The fiery reaction came after a series of deadly militant attacks in five days from Sunday killed more than 100 people across Pakistan, including civilians, the police and soldiers. This is the worst spell of violence since 2014, when Pakistan launched an operation to eliminate militant sanctuaries in its north-western tribal region. Violence decreased considerably as a result, with Pakistani leaders claiming the militants had been defeated. But this week, that sense of security has been blown away. 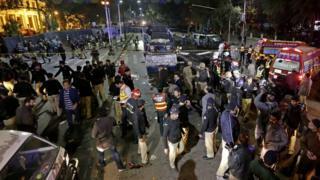 The latest surge in attacks comes amid reports of the reunification of some powerful factions of the Pakistani Taliban. Some of them have links with the Afghanistan-Pakistan chapter of the so-called Islamic State, which itself emerged from a former faction of the Pakistani Taliban. Most of these groups have hideouts in border areas of Afghanistan, where they relocated after Pakistan launched its anti-militant operations. Pakistan now accuses Afghanistan of tolerating these sanctuaries. It also blames India for funding these groups. Officials say India and Afghanistan want to hurt Pakistan economically and undermine China's plans to build a multi-billion dollar "economic corridor" through the country. But many in Pakistan and elsewhere don't buy that argument. They believe that militancy in Pakistan is actually tied to the country's own covert wars that sustain the economy of its security establishment. In Kashmir, for example, the BBC has seen militants living and operating out of camps located close to army deployments. Each camp is placed under the charge of an official from what locals describe as the "launching wing" of the intelligence service. In Balochistan, which has been under de-facto military control for nearly a decade, state agencies have allegedly been promoting Islamist militants to counter an armed separatist insurgency by secular ethnic Baloch activists. Last year the regional police compiled a report on militant sanctuaries across several parts of Balochistan, but an operation recommended by the police in those areas was never launched. Likewise, the world knows about the safe havens which the Afghan Taliban continue to enjoy in the Quetta region and elsewhere in Balochistan province, as well as in some parts of the tribal region in the north-west, from where they continue to launch raids inside Afghanistan. Many observers believe that the Pakistani military uses militant proxies to advance its wars in Afghanistan and Kashmir, and takes advantage of the domestic security situation to control political decision making. This is important, they say, if the military is to sustain a vast business, industrial and real estate empire which they believe enjoys unfair competitive advantages, state patronage and tax holidays. The military establishment rejects such arguments. But with such a cocktail of militant networks in the border region, many find it hard to buy the Pakistani line that India and Afghanistan are to blame. All militants on the ground - from disputed Kashmir to Quetta and Afghanistan - come from the same stock. They are the second-generation standard bearers of an armed Islamist movement that was formed on Pakistani soil during the Soviet invasion of Afghanistan in 1980s. They may have regional affiliations or partisan loyalties, but all have been raised under the influence of Wahhabi Islam and its various ideological offshoots, imported here by Arab warriors who came to help liberate Afghanistan. As such, they are capable of forming complex group-alliances and cross-border linkages with each other. And they are all united in considering Shia Muslims and Sunni adherents of native Sufi Islam as misguided and heretical. This may also partly answer the riddle as to how these groups manage to survive and operate even though they do not command popular support in any part of Afghanistan or Pakistan.